The Cabbage Soup Diet is a fad diet that requires its users to eat cabbage soup several times a day. When you follow the program, you can also eat a few other low-calorie foods, like any fruit (except bananas), beef, vegetables, and skim milk. As a result of the diet, your calorie count will drop so that you reach the calorie deficit needed for weight loss. You can find many different versions of The Cabbage Soup Diet online. You'll find recipes for cabbage soup and a list of specific foods to eat each day in addition to the soup. You can stock up on the foods to get ready for your slim-down. Every day you will consume multiple bowls of fat-free cabbage soup and a few of the low-calorie allowed foods. You'll choose from small amounts of fat-free milk, fruit, vegetables, and lean meat, depending on the version of the plan. Meals must be prepared and consumed in the home since it would be difficult to order the foods required for the plan at a restaurant. Since soup recipes vary, there isn't one perfect set of nutrition facts for cabbage soup. If you use a specific recipe, you can use a recipe analyzer to get a complete set of nutritional data. However, if you are simply curious about the calories in cabbage soup, figure that you'll consume about 50-100 per bowl. Portion size will make a difference and the thickness of the soup matters too. Keep in mind that cabbage soup can be very high in sodium, providing nearly 100 percent of your recommended daily allowance if you consume several bowls. The good news, however, is that because the soup is made with plenty of vegetables, you'll get a few grams of fiber in each bowl. Most recipes provide 3-5 grams of fiber per bowl which can help you to stay fuller longer. Most recipes also provide a bit of protein (about 5 grams), roughly 13 grams of carbohydrate and only about 1 gram of fat. 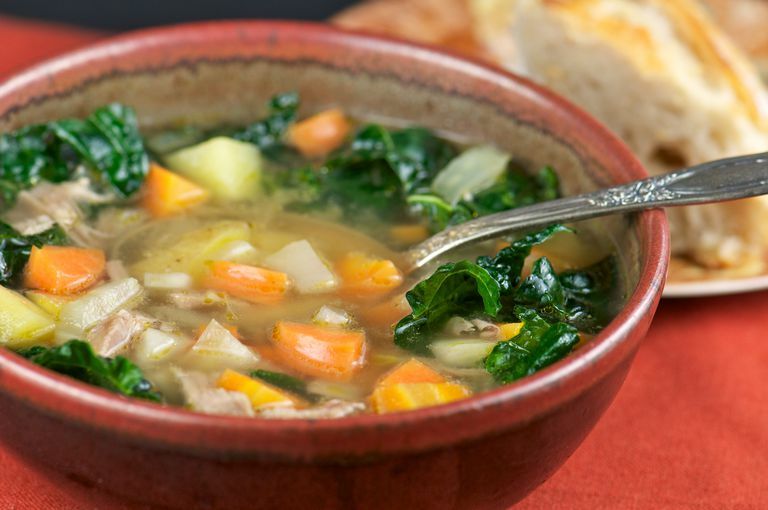 You're likely to get bored on The Cabbage Soup Diet. Not many people like cabbage soup enough to actually enjoy it every day for an entire week. And you're not allowed to eat the foods you are most likely to enjoy. Unfortunately, the diet plan is not based on any nutritional or medical science. There is no scientific proof that cabbage or cabbage soup has any of the fat burning properties that are often advertised in the diet's description. In addition, the diet plan provides no advice for dealing with emotional eating or developing skills that are required for long-term weight loss such as changing eating habits or controlling portions. So after the diet is over, you're likely to gain back any weight you lose. And lastly, most versions of the diet typically do not include any advice on exercise. Although, it's unlikely that anyone following a plan like this would have enough energy to exercise due to the low-calorie intake. In general, no one should follow a diet plan under 1,200 calories without participation from your health care provider. So any plan providing so few calories should be avoided. Doing so could lead to serious health issues and at the very least, can cause your weight to rebound when the diet is complete. Some people will lose weight on the Cabbage Soup Diet. But it's the extremely low-calorie intake that is responsible for the weight loss experienced in this short time. There is nothing magical or special about cabbage soup that makes weight loss happen. The Cabbage Soup Diet doesn't work for most people and is of little to no use to someone who has more than a couple pounds to lose. Even worse, many versions of the Cabbage Soup Diet could be unsafe. Talk to your doctor or a registered dietitian before beginning this or any other restrictive diet plan. Can You Simply Sleep Away Excess Weight?